Weekly Roundup Ideas 3-16-15: SPUR Discusses Transit Integration and more – Peninsula Moves! Bay Area Venues Host CAAMFest: The Center for Asian American Media is once again staging its annual CAAMFest, a celebration of Asian American storytelling and cultural expression. The event, featuring films, music, food and other creations, is currently taking place in locales throughout the Bay Area. Until March 22, when the festival closes, there will be plenty of opportunities to watch films covering an array of diverse topics vital to Asian American life, ranging from themes about youth voices in China to Muslim identity issues and the Miss Indian American beauty pageant. SPUR Discusses Transit Integration: With more than two dozen different transit agencies in the Bay Area, there has long been talk of the need to better integrate public transportation networks in the region. On Thursday, SPUR, a San Francisco-based think-tank, will host a lunchtime forum to discuss this topic, based on a new report from the Transportation Research Board that offers guidance on the issue. Gail Murray, a member of BART’s Board of Directors, and Joey Goldman, a consultant with Nelson/Nygaard, a national transportation development firm, will speak about their involvement in the Transportation Research Board’s report. The SPUR office at 654 Mission Street is accessible by numerous public transportation routes. 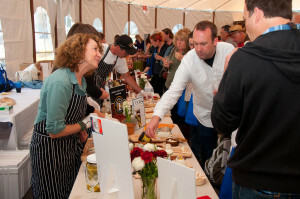 Photo via California’s Artisan Cheese Festival. Cheeseheads Unite For North Bay Food Fest: It’s no secret that residents of the Bay Area enjoy a little artisanal cuisine from time to time, and perhaps no food is appreciated quite as much as a slice of finely-aged cheese. That’s why the 9th annual California’s Artisan Cheese Festival, held at the Sheraton Hotel in Petaluma, will likely be a popular destination this weekend. The three-day event will have farm tours, training sessions led by cheese mongers, seminars, and, of course, plenty of tasting sessions. The event is just a few blocks from Golden Gate Transit and Sonoma County Transit bus lines.